Surpass is used for the production, delivery and results management of all high-stakes examinations undertaken by SQA, and is therefore recognised as a business-critical system. With over 450,000 entries per year for the National 5, Higher and Advanced Higher Assessments, SQA consider it essential that the systems we utilise are both robust and secure, for the creation and storage of all on-screen and paper-based content. In addition to large volumes of high-stakes summative examinations being delivered on paper, SQA have been leaders in the use of on-screen technology for General Qualifications. Each year over 70,000 on-screen examinations are delivered through the Surpass Platform, making us one of the largest users of on-screen technology for General Qualifications high-stakes assessments. By utilising Surpass over many years, we have been able to effectively manage our existing examinations and processes, whilst also implementing significant business improvements. For example, prior to using Surpass, the geography of Scotland and network of thousands of Subject Matter Experts (SMEs), sometimes in remote locations resulted in the manual transportation of paper, making process difficult and costly to manage. Surpass has revolutionised this process by providing a secure authoring environment with the ability to work remotely and offline, minimising meeting times and increasing flexibility of authoring and review. With over 100 teams working in Surpass on the paper production of National Qualifications, streamlining the process has been essential to efficient assessment development. In partnership with BTL since 2004, SQA took a leading role in the initial development of Surpass, providing knowledge and expertise pivotal to designing an assessment platform that met the needs of the global community. We continue to be a leading contributor within the Surpass Community, working closely with BTL and its growing community of over 180 organisations all using Surpass to power their assessment. SQA are committed to the use of technology to enhance the efficiency of their operations, whilst putting the candidate first, and we continue to be at the forefront of this field. Using Surpass, we have allowed candidates to self-schedule formative and practice examinations on-demand, in order to familiarise themselves with the test environment in preparation for their summative examinations. 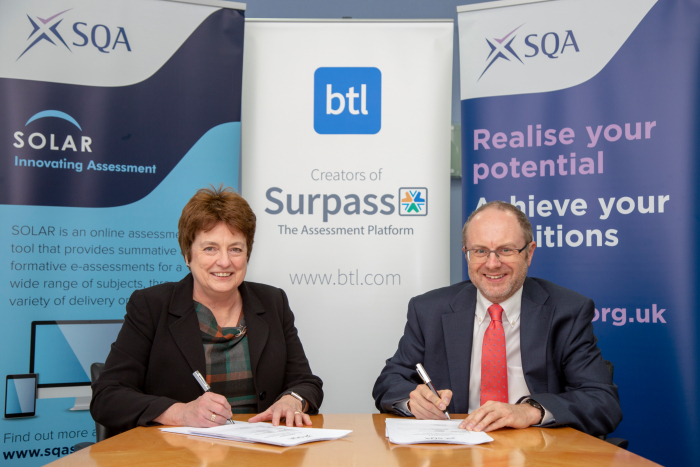 More recently, SQA have collaborated with BTL on the creation of SurpassPaper+, an innovative solution designed to provide a bridge between paper and on-screen testing. Pilots of SurpassPaper+ and further research into options for gathering digital evidence are ongoing. SQA value change and the significant improvements it can bring both operationally and to the candidate experience and are committed to undertaking rigorous research in order to find the best possible solutions.